AUSTIN, TX. – Mitchell, Williams, Selig, Gates & Woodyard, P.L.L.C. 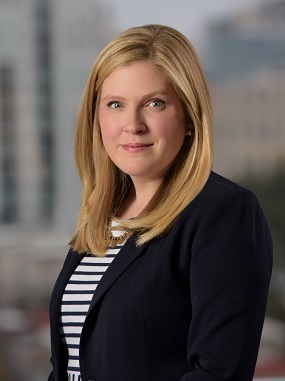 announced attorney Brytne Kitchin has joined the firm’s Austin office. Kitchin joined the firm as an associate with the insurance regulatory group where she will focus her practice on representing water, energy and healthcare clients in administrative proceedings and litigation, as well as counseling on operational and regulatory issues. She is experienced in assisting client with obtaining regulatory approvals, including certificates of authority from the Texas Department of Insurance, and certificates of convenience and necessity and rate adjustments from the Public Utility Commission of Texas. She also has experience in complex litigation matters in state and federal court and assists clients with entity formation, trademark renewal applications, post-data breach compliance and data security protocols. Kitchin earned a Juris Doctor from The University of Texas School of Law and a Bachelor of Science in Business Administration at the University of Illinois at Urbana-Champaign. While attending The University of Texas School of Law, she served as staff editor of the Texas Environmental Law Journal and received the Dean’s Achievement Award. She is a member of the Austin Bar Association, Austin Young Lawyers Association and the Travis County Women Lawyers Association. Mitchell, Williams, Selig, Gates & Woodyard, P.L.L.C. is a full-service corporate law firm that provides strategic, comprehensive legal services to help clients achieve their goals. Established in 1954, the firm has offices in Little Rock, Rogers and Jonesboro, Arkansas and Austin, Texas.